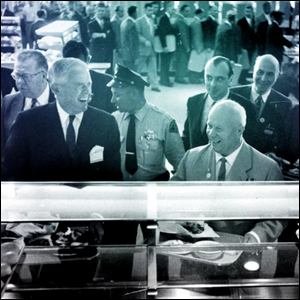 When Khrushchev Visited IBM’s California Facility In 1959, He Brought The Concept For What Home With Him? Iconic Children's Toy Play-Doh Got Its Start As? When the Soviet Premier, Nikita Khrushchev, toured the United States in September of 1959, one of his stops was at an IBM production facility in San Jose, California. You would think, naturally, that a tour of the factory would have impressed upon the Premier the advanced state of the U.S. computer industry, but by all accounts, he was entirely unimpressed with the computing side of the operation (believing that Soviet computers were just as good or even better than the ones he saw at IBM). The management and the employees both ate their meals in the lunchroom. Like everyone else, we picked up our utensils and went to the window where they give out the meals, they put our food on our plates, and we went back to whatever table we chose, and once we had eaten that dish, we could repeat the procedure and get another dish. It was a democratic arrangement. I think the management was deliberately trying to make a demonstration of democracy, and I admit that I liked it very much. In my speeches later on [back in the USSR], I promoted and encouraged this kind of food service for our factories: there was nothing superfluous anywhere in the operation. The surface of the tables in the lunchroom was plastic. All you had to do was wipe it with a damp cloth and the table was clean. Khrushchev would not be the only Soviet leader to visit the United States and walk away with a strong positive impression of our food and food-related systems. Thirty years later in 1989, Boris Yeltsin, who would become the first President of the Russian Federation the following year, made a surprise stop at an American grocery store in Texas. The sight of the enormous bounty of food found in even a small-town grocery store shook his belief in the efficacy of Communism and turned him into a reformer.